National Geographic Explorer Dan Buettner has traveled the world in search of the places where people live longer and healthier lives. In the Blue Zones: Lessons for Living Longer From the People Who’ve Lived the Longest, he has attempted to identify the factors that are involved in promoting longevity, so that we all may benefit regardless of where we live. Buettner defines a Blue Zone as an area where there is an unusually high number of people living until the age of a hundred or more. In addition, not only are they living a long time but they are also remaining vibrant and happy while they age. Four regions of the world are identified and the elements that may contribute to the remarkable occurrence of longevity in these areas are examined. In one village of 2500 people there were seven centenarians; a very high number considering that the ratio in the US is one per 5000. Sardinians eat a Mediterranean style diet with whole grains, fava beans, vegetables, fruits, sheep and goat milk products and red wine. Meat is reserved for Sundays and special occasions. Is now well known as one of the areas in the world where people live long and healthy lives. The Okinawan diet includes brown rice, soy products such as miso and tofu, vegetables, sweet potatoes and fish. Pork is consumed only for very infrequent ceremonial occasions and is taken in small amounts. An important aspect of the Okinawan approach to diet is to eat until only 80% full, which results in a moderate restriction of calorie intake, one of the factors associated with longevity. Here there is a population of Seventh Day Adventists and a well-known health study has documented that Adventists live longer than the rest of the population and their vegetarian diet is thought to be the most likely cause of this. Specific dietary factors that may be involved in their outstanding health include a high intake of fruit and vegetables, oatmeal, nuts and water. This is where the world’s healthiest and longest-lived people were found. Their diet includes orange, mango, papaya, corn, beans, rice, squash and eggs. The water in this region is also particularly high in minerals such as calcium and magnesium. Common to all of the Blue Zones was a strong emphasis on family and community. Social support is one factor that may be involved in the low level of stress that is reported by the centenarians. The longest living people in these communities have worked in physical labor their entire lives and most of them are still active. They have a strong sense of purpose as well as defined spiritual beliefs and practices. Fruit, vegetables, beans, tofu, nuts, dark chocolate, sheep and goat milk, whole wheat bread, brown rice, oatmeal, corn, sweet potatoes, miso, red wine. A diet plan is not included in the book because the author believes that a rigid program with weekly goals may be difficult for people with busy lives to follow. Instead he recommends that you gradually incorporate small changes in your lifestyle, as this will give the greatest chance of long-term success. The type of exercise undertaken by centenarians was usually related to their daily work routine. For example, Sardinians do a lot of walking in their work as shepherds, Okinawans spend time gardening and Adventists take regular nature walks. Readers are advised to do a combination of aerobic, balancing and muscle-strengthening activities. Yoga is especially favored because it helps improve balance, strengthens muscles, increases flexibility, is good for the joints, and may provide the same social support and emotional balance as spiritual practices. 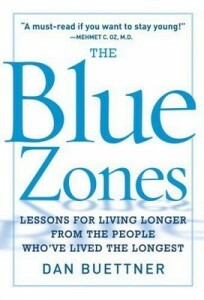 The Blue Zones: Lessons for Living Longer From the People Who’ve Lived the Longest retails at $14.95. May increase likelihood of reaching maximum life expectancy. Addresses the psychosocial aspects involved in creating health and longevity. Interesting reading for those who want to know more about long-living cultures. The Blue Zones website provides online support that helps you to assess your current potential life expectancy and offers suggestions to help you increase your lifespan. Many of the recommendations are vague and non-specific. The Blue Zones is not so much a diet and lifestyle plan, but more of an exploration of the factors that might be involved in supporting longevity. It provides interesting reading for those who are interested in optimal health but leaves it up to the reader to work out how to incorporate these elements into their life. Buettner, D. (2012). The Blue Zones: 9 lessons for living longer from the people who’ve lived the longest. National Geographic Books.